Disclaimer: I didn’t film all my food. For example, I had a mushroom cheesesteak in Bethlehem that tasted quite good. I also had an undocumented slice of pizza during the first weekend. Anyway, here’s a video recap of my recent trip to the United States. Thursday, June 28th, found me attending the seventh music event on the eighth day of my vacation. I had strolled the streets of Manhattan earlier that day and ate a delicious veggie burger at Earthmatters (177 Ludlow St New York, NY 10011). My feet got tired, eventually, and it was still rather hot outside, so I went to the Rockwood Music Hall in time to catch a couple of songs by the first artist playing there that evening. Matt Dorien sounded quite nice, playing some sort of mellow but not really mellow country folk songs (a bit Paul Simon-y in terms of the vocals) with a neat backing band. The sound man provided a good, balanced mix throughout the evening; my tortured ears were thankful. There were eight people in the audience (including me). I could write a whole post about this alone, because it shows a) that playing in NYC isn’t necessarily as glamorous as it sounds and b) despite the meagre attendance, the musicians gave it all and earned if not money at least valuable respect and experience. Next came Emily Elbert, a jazzy singer who accompanied herself on acoustic guitar. She actually tore one of the strings towards the end, because her playing was quite energetic, yet still artistic. Her command of her talent was impressive, however, I’m not a fan of such daring tonalities. The crowd (about 25 by now!) liked her quite a bit, though. Daniel and the Lion played laid back folk songs, but they had an aweful lot of very somber, soft songs. My attention drifted time and again as I failed to connect to the songs. 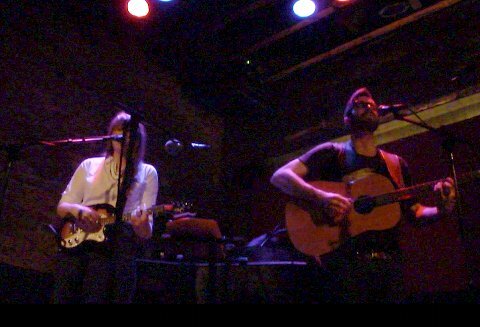 The duo (piano and guitar/vocals) had come from Wisconsin to find about 30 people listening (which made the venue half-empty/half-full). Again, I doubt any artist can achieve sustainable success without this sort of commitment. Still, even then it comes down to whether the front row is swinging in the groove or not. People seemed to enjoy the show and were listening attentively during the quiet parts, even though they had chatted loudly just a few minutes earlier. This certainly helped to make the performers feel good. Around 9 pm it was time for Sophie Madeleine, the reason I had come to the venue. She’s one half of Rocky & Balls whom I first found out about through Tom of the Boffo Yux Dudes. Some of her songs are way too “fluffy” for my taste. Still, she has produced a few gems – and admission was free, after all! When Sophie (together with Timothy on guitar and harmony vocals) entered the stage, I was skeptical, because there was a ton of gear. Miraculously, the change over didn’t take too long and everything worked. When the show began with pre-recorded loop samples, I was afraid that the gig would turn into a karaoke session. Thankfully, this wasn’t the case. Most songs were played 100% live – and for some songs, the loops were recorded on location, which was quite fascinating. Sophie did play my favourite song of hers, “Little One“, so I was happy. She also premiered a new song that was possibly the most introverted of the songs she played. The audience (still 30 noses) was once again attentive yet a bit reserved. I found it quite impressive to see such a flawless performance close-up in this small room right there in the middle of the big city. I was tempted to stay longer because all artists had been quite skilled and four more were to play. (The venue has hourly slots for artists every day of the week.) But my hotel bed beckoned and I wanted to end my week-long music adventure with a positive memory – and Sophie Madeleine had just provided one. It was Thursday, June 21st. I had arrived in Philadelphia coming from Zürich and drove south into the heat of Maryland (104° Fahrenheit). Not the most relaxing way to start one’s vacation but I didn’t want to miss the rare opportunity to see some one of the most underrated punk musicians coming out of retirement. After three hours of sleep in the hotel I got up and drove to the Ottobar. I got there half an hour before midnight local time. 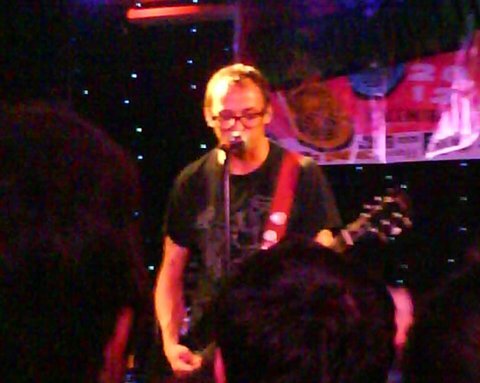 Mikey Erg was still on stage and sang some pop punk songs on his own with just an electric guitar (sounding excellent). His songs were pretty cool and he was obviously enjoying the gig. The audience – maybe 200 people – was in a good mood, too, albeit a bit exhausted, because the event (Insubordination Fest) was already rolling since 6 pm. Dr. Frank hit the stage after a really quick change over. His backing band that night were the Mixtapes, who delivered a powerful, passionate performance. Dr. Frank himself wasn’t completely sober and kept on drinking throughout the show. I guess a proper punk rock concert was a nice change for him compared to his usual book reading events that take place during the day and have young adult readers in the audience. I had no idea what kind of setlist to expect. Needless to say I was thrilled when “Sackcloth and Ashes” was played as opener. A barrage of MTX classics followed (“Here She Comes”! “Semi-OK”! “I Love You, but You’re Standing on My Foot”!). I loved every minute of it! The 30-second song “Told You Once” (off the “Short Music for Short People” compilation) was played three times in a row before the other musicians left Dr. Frank alone on stage for a couple of softer songs (mainly about alcohol and romance). The mood during this part of the show was especially relaxed. It was cool to see several other artists standing by the side of the stage and singing along every word by heart. 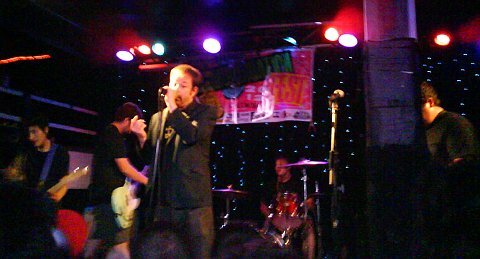 After a formidable version of “Even Hitler Had a Girlfriend”, the House Boat guys joined Dr. Frank for a couple of songs. Finally, two of the best songs (“Ba Ba Ba Ba Ba” and “Dumb Little Band”) from the best MTX album “Love Is Dead” concluded the set and the audience went wild one last time. There were stagedivers and happy faces and all was good despite the Baltimore heat at 1 am. I hesitate to lament the lack of public interest in the event. It was great to see this style of music played in such a small place. No way a stadium gig could feel as imminent. It all reminded me of the MTX concert I attended back in 2001 in Stuttgart, Germany. Maybe it’s even a good thing that shows like these have become scarce. We’re all getting older and punk rock nostalgia is one of the ugliest forms of nostalgia if you ask me. Still, on that sweaty Thursday night Love might have been dead, but Punk certainly wasn’t. PS: I’ll leave you with the wise words of Ben Weasel, who wrote on February 1st, 2004: In the meantime it’s worth the price of admission and then some to see [the Mr. T Experience] play. Whatever one of those American Pie bands might be worth, the MTX is worth double, and I’m being kind to the AP bands. Buy their CDs. See them play. Be one of those few people who vote with their dollars for substance over posturing; for quality over marketing magic. Because twenty-five years from now, do you really wanna be the person who decided to see Journey when you could’ve seen AC/DC with Bon Scott? Of course you don’t.